Last week during my webinar, I wasn't sure how to use the EnumerateResources or EnumerateResourceIteration activities. I thought I'd tie up some loose ends and try to crack this case. 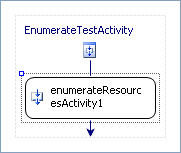 Thanks to Henrik and Nima, I was able to get the EnumerateResourcesActivity to work. Turns out that the Iteration activity will be removed from RTM. Per Henrik's advice, EnumerateResources has the wrong designer, so when you add the activity to a custom workflow, you'll notice that it's closed and you can't add any children to it. Next, add the code activity to EnumerateResources in InitializeComponent, before the last line, "this.CanModifyActivities = false;". That's it. Don't forget to bind the XPathFilter property on the EnumerateResourcesActivity. Perhaps I'll add an example to our activity library. Great you got it working! I hardly can't wait getting a new dev environment so I can start working with this activity!!! Can you give some more details on how to pass the arguments to the logIteration(object sender, EventArgs e) method. I mean from where do I get the sender object?.. I am very new to FIM and trying to learn few basic stuff..
always give me NULL value.